(a) Disengage the 5 clips and turn up the front side of the deck board. (a) Remove the rear floor service hole cover. (b) Disconnect the fuel pump & sender gage connector. Remove the tube joint clip, and pull out the fuel pump tube. When the pipe and connector are stuck, push and pull the connector to release and pull the connector out carefully. (b) Using SST, loosen the fuel pump gage retainer. NOTICE: Loosen the retainer by turning it counterclockwise while holding the SST down. Do not allow the claw of the tank suction tube support to slip out of its groove on the fuel tank. HINT: A rib on the fuel pump gage retainer can be fitted into a tip of the SST. (c) Remove the fuel pump gage retainer. (d) Remove the fuel suction tube. NOTICE: Be careful not to bend the arm of the fuel sender gage. (e) Remove the gasket from the fuel tank. (a) Disconnect the fuel sender gage connector. (a) Using a screwdriver with the tip wrapped in tape, disconnect the 4 snap-claws from the claw holes and remove the fuel suction plate. NOTICE: Do not damage the fuel suction plate and fuel suction support No. 1. (a) Disconnect the fuel pump connector. (b) Using a small screwdriver with its tip wrapped in tape, disconnect the 2 snap-claws from the claw holes and pull out the fuel pump. NOTICE: Do not damage the fuel pump and fuel suction plate. (c) Remove the O-ring and fuel pump spacer from the fuel pump. (a) Using a small screwdriver, pry out the clip. (b) Remove the fuel filter from the fuel pump. (b) Using a screwdriver with its tip wrapped in tape, disconnect the snap-claw from the claw hole and pull out the fuel tube joint. NOTICE: Do not damage the fuel tube joint and fuel suction plate. (a) Remove the harness from the fuel tube joint No. 1. (b) Pull out the pressure regulator from the fuel tube joint No. (c) Remove the 2 O-rings from the fuel tube joint No. 1. (a) Apply a light coat of gasoline or spindle oil to the 2 new O-rings, and install them to the fuel pressure regulator. (b) Apply a light coat of gasoline or spindle oil to the 2 O-rings again, and install the fuel pressure regulator to the fuel tube joint No. 1. (a) Apply a light coat of gasoline or spindle oil to a new Oring, and install it to the fuel tube joint No. 1. (b) Apply a light coat of gasoline or spindle oil to the O-ring again, and install the fuel tube joint No. 1 to the fuel suction plate. (a) Install the fuel filter with a new clip. (a) Install the fuel pump spacer to the fuel pump. (b) Apply a light coat of gasoline or spindle oil to a new Oring, and install it to the fuel pump. (c) Apply a light coat of gasoline or spindle oil to a the O-ring again, and install the fuel pump to the fuel suction plate. (d) Connect the fuel pump connector. (b) Apply a light coat of gasoline or spindle oil to the O-ring again, and install the fuel suction plate to the fuel suction support No. 1. (a) Install a new gasket to the fuel tank. (b) Attach the fuel suction tube to the fuel tank. NOTICE: Be careful not to bend the arm of the fuel sender gage. (c) Align the keyway of the fuel suction tube support with the key of the fuel suction tube. (d) Apply MP grease to the entire interior surface of the fuel pump gage retainer. (e) Align the triangle mark on new fuel pump gage retainer with the "S" mark on the fuel tank while pushing down the fuel suction tube, attach the fuel pump gage retainer. (f) Rotate the fuel pump gage retainer by hand, then tighten it one complete turn and half using SST. 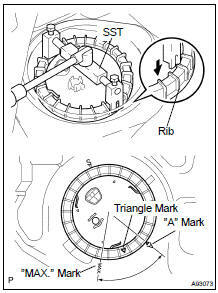 Triangle mark on the fuel pump gage retainer must be positioned between "A" and "MAX." indications on the fuel tank. NOTICE: Do not use other tools in this operation. Damage to the fuel pump gage retainer and the fuel tank may result. (g) Connect the fuel pump tube. Install the fuel pump tube and the tube joint clip. Check that there are no scratches or foreign objects on the connecting part. Check that the fuel tube joint is inserted securely. Check that the tube joint clip is on the collar of the fuel tube joint. After installing the tube joint clip, check that the fuel tube joint has not been pulled off. (a) Install a new butyl tape to the rear floor service hole cover. (b) Connect the fuel pump & sender gage connector. (c) Install the rear floor service hole cover.